In the fall and winter, you'll find huge golden chanterelle mushrooms at farmers' markets throughout southern California. Cantharellus californicus, a variety all our own. It grows happily at the base of California oak trees. The more rain we get, the bigger the chanterelles grow. I've seen golden chanterelles as big as dinner plates, I kid you not. The last time my mother came to visit from New York I took her to my local farmers' market. When I started piling beautiful golden chanterelles into a bag, she protested. "They're $15 a pound!" she said with a touch of outrage. "You're going to pay that much for mushrooms?" For the first chanterelles of the season, it didn't seem like a lot. It occurred to me that while I spend very little on clothes, shoes, electronics and lipstick, I spend quite a lot on local, seasonal produce. Which, in my book, is the way it should be. The simpler the better when it comes to golden chanterelles. I give them a quick rinse - I know people always say to brush mushrooms with a paper towel to get the dirt off, but I just can't get them clean enough without water. I saute them in butter or roast them in a hot oven. Then I add them to pasta, risotto or even pizza. 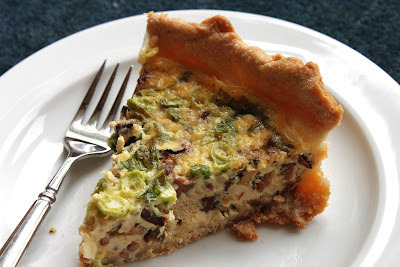 We get in a quiche mood now and again, and the last time it hit I had a big bag of fresh chanterelles. Golden chunks of mushroom in a custard studded with bits of salty bacon, all captured in a crumbly crust - now that's a meal. Chunks of golden chanterelle mushrooms and crumbled bacon suspended in a creamy custard, baked up in a flaky tart crust. Make the crust: In a large bowl, whisk together the flour and 1/4 tsp salt. In a measuring cup, lightly mix the olive oil and milk. Pour the olive oil mixture into the flour mixture and stir the dough together with a fork. When it comes together, use one hand to turn it over on itself in the bowl, kneading lightly, about 6 times. Turn the dough into a pie plate and press it up the sides and over the bottom of the baking dish, making sure there are no cracks visible. Put the unbaked crust in the refrigerator while you make the filling.Heat a large skillet over medium heat and cook the bacon until crisp. Take the bacon pieces out of the skillet and drain them on a plate lined with several layers of paper towel. Pour most of the bacon fat out of the pan, leaving just enough to saute the mushrooms. Add the chopped chanterelles to the pan and saute over medium-high heat about 10 minutes, until the mushrooms have given off their liquid and most of the moisture has boiled off. Remove the pan from the heat. Preheat the oven to 375 degrees.Take the pie plate out of the refrigerator and crumble the goat cheese over the bottom crust. Scatter the green onions over the cheese, then pour in the bacon and mushrooms. In a large bowl, whisk together the eggs, half-and-half, dry mustard powder, remaining 1/4 tsp salt and freshly ground pepper. Pour the egg mixture over the stuff in the unbaked crust. Line a baking sheet with foil to catch any drips and put the pie plate on top of the foil. Bake the quiche about 45 minutes, until the middle is set, the top is lightly browned and the crust is golden brown. Let cool at least 30 minutes so the quiche has time to set up - otherwise it will fall apart when you cut it. Serve at room temperature. Oh yes. Quiche is the answer to many questions, and with your chanterelles, it looks like nirvana! I'm sure they are worth every penny. I adore quiches and I can't wait to try this one out. Thank you for sharing...we're getting ready to go to Colorado, and I'm glad I got a chance to stop by before we depart. Happy holidays and many blessings! Every week I look at those gorgeous golden mushrooms at the Farmer's Market and wonder what people do with them... now I know. Thanks! I can't to try this recipe.